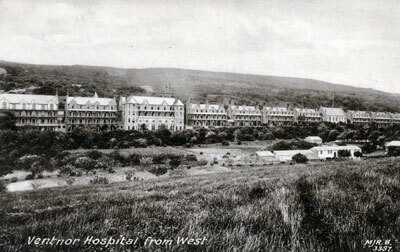 The Royal National Hospital, Ventnor opened in 1869 for the treatment of chest diseases - mainly tuberculosis. It consisted of a number of 'cottages' for the patients with a chapel in the centre. At that time, the main treatment for such diseases was fresh air and sunshine - two elements which the location at St Lawrence was able to provide. With the development of antibiotics for the treatment of tuberculosis, the need for the hospital diminished, and the design and state of the buildings made them unsuitable for any other purpose. The hospital closed in 1964 and was demolished in 1969. The site is now the Ventnor Botanic Gardens.